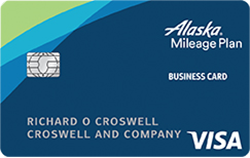 Please see Terms and Conditions for Alaska Airlines Visa Business Card for rate, fee and other cost information. All terms may be subject to change. Travel services your business needs including $1,000,000 in travel accident insurance and auto rental insurance, emergency ticket replacement, lost–luggage assistance and the option to get extended protection.